Best Breakfast in Hawaii – At McDonalds? Finding the Best Breakfast in Hawaii isn’t something you dream about when you are packing the swimsuit and sunscreen. At least I don’t. But traveling always brings a little angst when it comes to eating out, and dining secrets aren’t exactly the mainstay of Yelp! and Foursquare. Searching for that 4 star or better place on Yelp! might be safe, but it isn’t Beach Street. One of the cool things about living at the beach is the traveling and cool toys or should I say Kühl Toys. All of that leaves us a little hungry. While cruising Beach Street wherever I am, the search for good local food is always a priority. Up and down the California Coast on PCH I have found great local hideouts that somehow miss the tourist crowd. Once in a while I find one that has both the great local vibe and a tourist based business like the Shake Shack. Ruby’s diners are always a winner just because of the location. Ruby’s are one of our favorite places to bring guests who haven’t been to the beach but the reality is they are tourist hangouts, not really our thing. The truth is that most of the time the Beach Street and Kühl Toys gang concern ourselves with a great happy hour and great dinner to add to our Search Tiki Database. Places like SuperMex in Huntington Beach have a rocking happy hour that goes till seven while the local tourist traps double your bar tab after five. We haven’t really looked to hard for the best breakfast in Hawaii because let’s face it, how hard is it to make eggs and bacon or waffles. At the beach we make it easier with breakfast tacos. Scrambled eggs, cheese, meat and maybe potatoes with salsa. Add avocado at Del Taco and you pretty much have a the Beach Street Breakfast covered. If you want to go upscale you hit Sancho’s Tacos just across from the pier in Huntington Beach. The staff here at Beach Street assumed the Loco Moco was the standard for the best breakfast in Hawaii. But none of us like it. Once we even tried the new breakfast box at Jack in the Box. Bad idea. A few friends say it is a pretty good hang over cure and pretty tasty if you have the mary jane munchies. We don’t recommend trying it though. If you really need a hang over cure, call über and head to Mutt’s in Newport for a Bloody Mary. But you aren’t reading this to avoid Jack in The Box in Honolulu or get a Bloody Mary at Mutts are you? Spending a lot of time on the Hawaiian islands without Del Taco got me searching for the Hawaiian surf breakfast. There had to be something easier on the stomach that a Loco Moco. Eventually I found that Eggs, Rice and Portuguese Sausage for the regular sized guys is a pretty good surf breakfast. Imagine my surprise while out surfing in Kauai, when a local said the best breakfast was at McDonalds. They call them the “local specials” or “local deluxe”. He said they use some of the best sausage available on the islands to any restaurant, and that he didn’t like Soy Sauce. McDonalds was the only place that served real butter for the rice. Blessed with an iron gut like Anthony Bourdain, I’ll try just about anything once. On my next trip back to Hawaii, I was again in Lihue. After a nice hike through a very well kept neighborhood, I found the McDonalds and ordered the local deluxe breakfast and a Guava Pie. Per the surfers instructions, I requested butter instead of soy sauce. As I sat down to my 2000 calorie tray of rice, eggs and meat I realized that it didn’t look anything like a fast food breakfast on the mainland. Looking around the room, I was the only mainlander in there eating breakfast. Many stopped by for coffee, and I did see one mainlander get an Egg McMuffin to go. Mostly I was surrounded by happy locals chewing on spam. A Beach Street “Secret” right in plain sight. Unlike the touristy places though, you just don’t expect it here. In high school my best friends mom used to make us Spam and cheese sandwiches at lunch and fried Spam for dinner. Back then I thought it was good stuff so I was looking forward to this. Apparently, somewhere along the way, I lost my taste for Spam. It was clearly just me given how fast the locals were putting the spam away. The Portuguese sausage on the other hand was really good. A young local noticed that I skipped the spam and said “Hey Uncle, next time you get da plate no spam, double sausage, I tink you like it mo bettah” Since then I have cut back to just a single serving of sausage, and tried the same meal at just about every other restaurant on Maui, Oahu, Hawai’i and Kaua’i. The restaurants claiming to be “Best Breakfast” award winners all over the islands are still serving margarine and that is the deal breaker. The eggs are usually better at the places charging $15 and up for essentially the same breakfast as McDonalds. At under $10 including the drink, the verdict is the same, real butter more than makes up for oddly yellow scrambled eggs. Better yet, I have more spare change to shop for a happy hour after surfing and hunting for Kühl Toys. The Best Breakfast in Hawaii award goes to McDonalds as far as I am concerned. Two more secrets I have since learned. 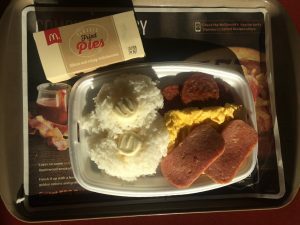 The Haupia Pie, Taro Root Pie and the Guava Pie are special editions at McDonalds for Hawaii only. The Taro Root Pie is addicting never mind the purple color, and the guava has that tang that makes the new Hawaiian Cookie Company cookies so good. The Haupia pie is a favorite among locals but way too sweet for me, and I like Piña Coladas. Wait did I say that out loud? Previous Topic: Soundproofing – Is There Really Such A Thing? Next Topic: Vans US Open Of Surfing 2017 Final Weekend!